The US EPA Is Successfully Separating A Health Scare From A Health Threat ! On September 12th, 2016, the US EPA reported that Glyphosate DOES NOT CAUSE CANCER. According to the US EPA, « the available data at this time DO NOT SUPPORT A CARCINOGENIC PROCESS for Glyphosate ». The US EPA’s assessment of Glyphosate was based upon an extensive data-base exists for evaluating the carcinogenic potential of Glyphosate, including 23 epidemiological studies, 15 animal carcinogenicity studies, and nearly 90 genotoxicity studies for the active ingredient Glyphosate. On April 29th, 2016, the US EPA had also classified Glyphosate as « Not Likely To Be Carcinogenic To Humans », the SAFEST CLASSIFICATION on the scale. The US EPA’s assessment of Glyphosate DISCREDITED the anti-Glyphosate report by International Agency for Research on Cancer ( IARC ) which CONVENIENTLY DISREGARDED SEVERAL STUDIES on the effects of exposure to Glyphosate purely on the basis that these studies showed NO positive results. The US EPA report also noted that the studies IARC chose to include in its report had SIGNIFICANT LIMITATIONS. Additionally, IARC’s anti-Glyphosate report was based on a review of the scientific literature that WAS NOT COMPREHENSIVE. IARC DELIBERATELY OVERSTATED THE RISKS with its arbitrary and selective « cherry picking » studies against Glyphosate. NO PESTICIDE REGULATOR IN THE WORLD CONSIDERS GLYPHOSATE TO BE A CARCINOGEN, and both US EPA reports once again reinforce this important fact. This is not the first time that the US EPA has said this, and it will not be the last. Glyphosate is the most widely used herbicide in the United States, originally developed by Monsanto and sold under the name Roundup. Not only has Roundup been used for the last 42 years, but Glyphosate has been incorporated into hundreds of additional products for the last 16 years. Over the years, the US EPA has vacillated on their classification of Glyphosate’s cancer-causing ability. MID-1980s ― Glyphosate was first assessed as a « Possible Human Carcinogen ». [ ?!?! ] Shortly thereafter, the US EPA correctly began re-evaluating its assessment. 1986 ― Glyphosate was downgraded to ..
APRIL 2016 ― Which bring us to April 2016, when the US EPA classified Glyphosate with the SAFEST RATING on its scale. It was the report on April 29th, 2016, published on-line for a weekend and then strangely pulled down after a few days, which is the PREDECESSOR of the LATEST SECOND REPORT. BACKGROUND INFORMATION ― US EPA GLYPHOSATE REVIEW PANEL REPORT HAS DISCREDITED IARC ! 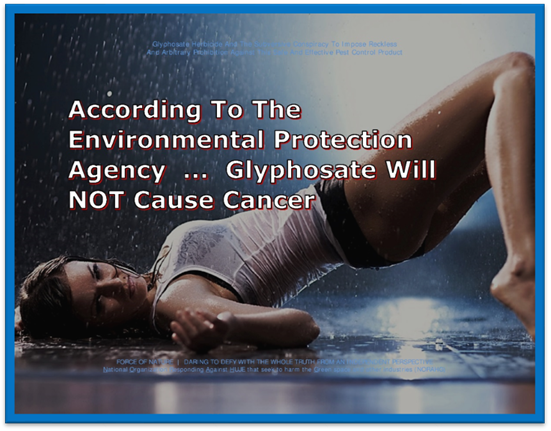 ― Glyphosate WILL NOT CAUSE CANCER according to the Review Panel Report published on-line by the Cancer Assessment Review Committee at the United States Environmental Protection Agency ( US EPA ) on April 29th, 2016. The US EPA report DISCREDITED the anti-Glyphosate report by International Agency For Research On Cancer ( IARC ) which CONVENIENTLY DISREGARDED SEVERAL STUDIES on the effects of exposure to Glyphosate purely on the basis that these studies showed NO positive results. IARC officials are CATEGORICALLY WRONG about Glyphosate, an ingredient that has been assessed to be SCIENTIFICALLY-SAFE. Seemingly, IARC officials will say ANYTHING in order to validate their ANTI-PESTICIDE AGENDAS, including faking data, designing pointless and inferior research, and prejudicially giving greater weight to research results that only agree with their twisted objectives. The US EPA report also noted that the studies IARC chose to include in its report had SIGNIFICANT LIMITATIONS. Additionally, IARC’s anti-Glyphosate report was based on a review of the scientific literature that WAS NOT COMPREHENSIVE. IARC DELIBERATELY OVERSTATED THE RISKS with its arbitrary and selective « cherry picking » studies against Glyphosate. According to Monsanto, the company that developed Glyphosate, NO PESTICIDE REGULATOR IN THE WORLD CONSIDERS Glyphosate TO BE A CARCINOGEN, and the US EPA report once again reinforces this important fact. Unfortunately, IARC’s INCONSISTENT CLASSIFICATION of Glyphosate has GENERATED UNWARRANTED CONCERN AND CONFUSION about Glyphosate. There is something HORRIBLY WRONG when IARC officials CONSPIRE with Pesticide-Hating Fanatics and their Environmental-Terrorist Organizations to DICTATE PUBLIC POLICY based upon reports THAT ARE WRONG ! The LATEST SECOND REPORT in the series, entitled « Glyphosate Issue Paper – Evaluation of Carcinogenic Potential », represents the US EPA’s « proposed » position on Glyphosate. An extensive data-base exists for evaluating the carcinogenic potential of Glyphosate, including 23 epidemiological studies, 15 animal carcinogenicity studies, and nearly 90 genotoxicity studies for the active ingredient Glyphosate. These studies were evaluated for quality and results were analyzed across studies within each line of evidence. The modified Bradford Hill criteria were then used to evaluate multiple lines of evidence using such concepts as strength, consistency, dose response, temporal concordance and biological plausibility. THE AVAILABLE DATA AT THIS TIME DO NO [ sic ] SUPPORT A CARCINOGENIC PROCESS for Glyphosate. Overall, animal carcinogenicity and genotoxicity studies were remarkably consistent and did not demonstrate a clear association between Glyphosate exposure and outcomes of interest related to carcinogenic potential. The LATEST SECOND REPORT is destined to be part of a THREE PART SERIES. The final report is due out from the US EPA in early 2017 and I look forward to writing another article at that time, which ( spoiler alert ) will say that Glyphosate DOES NOT CAUSE CANCER. The three reports may seem redundant but, maybe, if the US EPA keeps saying that Glyphosate DOES NOT CAUSE CANCER, they will successfully separate a health scare from a health threat. Dr Julianna LeMieux, Senior Fellow in Molecular Biology at the American Council on Science and Health ( ACSH ), received her PhD in Molecular Biology and Microbiology from Tufts University, School of Medicine in 2008. Dr LeMieux followed that by a post-doc at MIT, working with C elegans. After teaching as an assistant professor for four years, Dr LeMieux realized her passion for science communication and joined the team at ACSH. Dr LeMieux enjoys writing about many different topics, but has a special place for infectious diseases, global health, and vaccines.